PennHIP .22/.35. These are very good distraction indices. Mace has very little risk of ever developing hip dysplasia. His parents' PennHIP scores were .25/.25 (sire) and .33/.38 (dam), and he got the best of both. At almost-10 years old, his hips are still free-moving and don't seem to give him any problems. 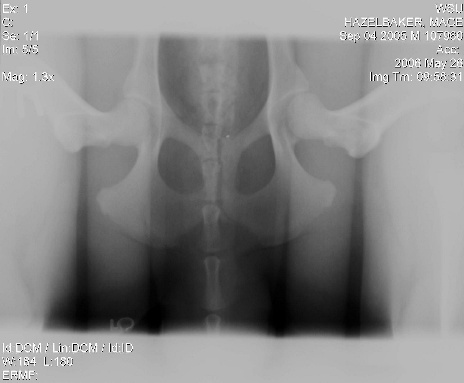 Mace's hip x-rays - on the left, the OFA/extended view, used to see any arthritic changes. On the right, the PennHIP/distraction view, used to measure just how tight the hip joint is. Even under tension, the balls of his hip are tightly seated in the sockets. When the vet did his x-rays, and came in to tell me they were done, he had a big grin on his face. They can't tell just what the indices will be, but they see enough x-rays to know when they will be good, or not. Mace's were very good. 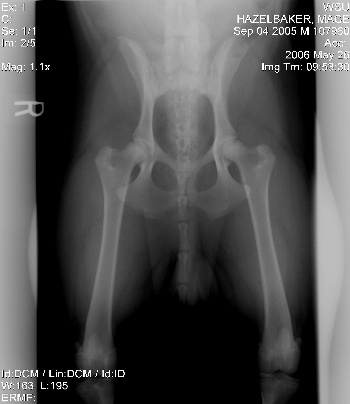 Some people wonder when they should have their dogs' hips evaluated with PennHIP. There is some thought that if you do it too early, the pup will still have loose ligamentation, and you won't get true readings. Mace's were done when he was a week shy of 9 months. PennHIP says that results are consistent from four months of age on.